Leggings are the one item we can guarantee that you’ll find in any woman’s closet. Which is why we’re dedicated to finding the coolest styles, newest trends, and innovative ways to wear all your favorite pairs. From yoga class to travel and everything in between, leggings are our go-to piece to cozy up in (and still look cool doing it). And while we wish there were endless ways to wear them, the fact is that their body-hugging shape looks best when paired with some length for a necessary balance. The one piece that makes wearing leggings alone totally doable? A long sweater or cardigan. The trick is to look for knits that are longer than the average, hitting about mid-thigh. Luckily, there are plenty of worthy options out there and we've sifted through them so that you can face the harsh winter that still lies ahead armed with this cozy outfit combo. Pair your sweater and leggings with a pair of sneakers or boots for the perfect laid-back look. Honestly, you may never want to wear your jeans again. Go on to see how to wear long sweaters with leggings, and then shop the knits we love. Try a colored pair of leggings with a patterned sweater for a standout version of the classic legging look. In fact, we had to look twice to even notice that this was a legging outfit. The perfect balance of chic and comfortable, this winter look is definitely one to copy. 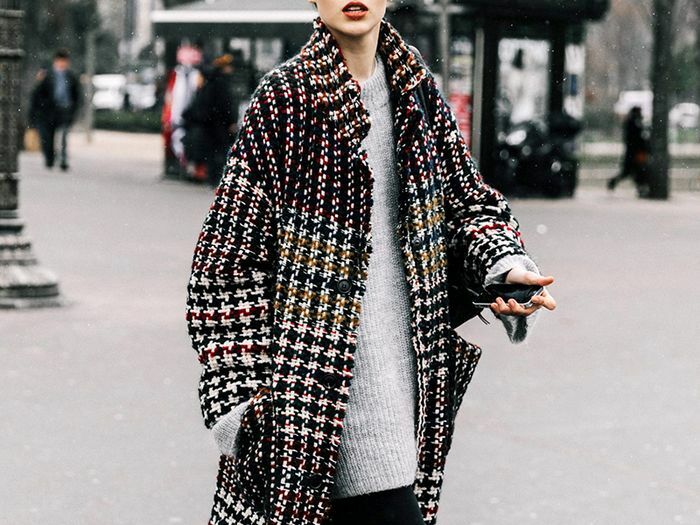 Swap your black jeans for a pair of leggings with this sweater and oversize coat look. Black chunky boots are the perfect finishing touch for an edgy yet still polished outfit. Take a style tip from Gigi Hadid and try a long top under your long sweater with leggings and heeled boots for a comfortable outfit that doesn't look like you just came from the gym. Your new weekend errand running outfit, found. This slouchy pick looks ultra-cozy. For an ultra-chic legging look. Pair with leggings and chunky boots for an on-trend look. Everything looks better in camel. We needed to include an animal print option, obviously. We love the subtle texture of this one. Feeling bold? Style this piece with white leggings. This flowing cardigan is all about the side button detail. A long turtleneck is so necessary to survive the winter. Layer over a neutral-toned turtleneck for extra warmth. Perfect for after your next workout. Go ahead, brighten up your legging. We'll never be over this color. Wear this sweater with leggings and knee-high boots. Zebra is the new leopard. You can't go wrong with a classic gray sweater. This post was originally published at an earlier date and has since been updated. Up next, eight winter sweater trends you don't need more than $40 for.